From gentle simmering to powerful flash frying, the NEFF T23S36N0GB gas hob brings responsive and versatile cooking to your kitchen. Cooking large meals is easy with the NEFF T23S36N0GB; this model has four burners with three power outputs – one high speed, one economy and two standard. 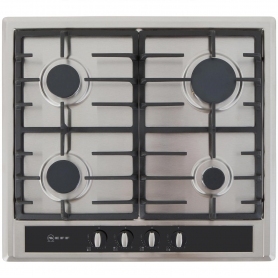 The burners also come in three sizes to suit a wide range of pots and pans. The hob has two black cast iron pan supports. These are sturdy, robust and built to last, easily handling everyday use with heavy pans. They are also dishwasher safe. Built for easy and simple use, the controls are positioned at the front of the hob and feature turn and push ignition. This allows you to ignite the burner with one hand, in a single movement. 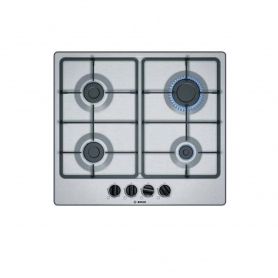 Designed to fit seamlessly into your worktop, the NEFF gas hob will add a touch of style to any kitchen. The brushed stainless steel finish gives the T23S36N0GB a modern look, complimented by the black of the cast iron supports. A black glass inlaid control panel completes the look. Functionality and practicality are at the forefront of the design. The stainless steel finish is easy to clean and the matt effect stops any fingerprint marks appearing. The cast iron supports come with rubber feet to ensure they don’t move as you’re cooking or scratch the hob. Leaving the kitchen to answer the phone or front door can be done safely thanks to the fitted flame failure safety device. This automatically shuts down the gas supply to the hob if the flame goes out. Add professional cooking to your kitchen with the stylish and powerful NEFF T23S36N0GB. Click Add to Basket to become the chef you know you can be.